We were bright-eyed twenty-one-year-olds when we invested every penny we had (and hadn’t, to be honest) into a brand new website. In this episode, we uncover what went so wrong in our first ever business, so you don’t make the same mistakes as us. 5.00- Why did it fail? 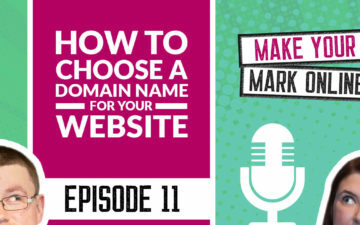 Welcome to episode nine of the Make Your Mark Online Podcast. In today’s episode, we’re going to be talking about why our first website failed so badly, and it’s gonna be a really interesting episode, but before we get into the show, we wanted you to know that we are running a free online webinar all about SEO for personal brands. Now this is taking place on Thursday, the sixth of September at 8:00 P.M. BST or 3:00 P.M. EST. Now if you’re listening to this podcast when it’s just being released, you still have a couple of days to sign up to the webinar. If you just go to JammyDigital.com/webinar, then you’ll be able to pop your name and email address on the page there, and we’ll send you our unique for the webinar. Okay, let’s get on with the show. So Martin, this is a really funny episode actually ’cause it’s kind of going back in time, but we weren’t always web designers, were we? No. Yeah, surprisingly I didn’t just happen to know HTML as a toddler. Yeah, it’s definitely something that we’ve picked up later on in life. Yeah, definitely. We’re talking about our first website, so this was when we were probably 21, 22. We were real babies. Yeah, eight, nine years ago, something like that. Yeah, something like that. Makes us feel very old. But like I said, we weren’t always web designers, but we did start up a completely new business, didn’t we? Yeah, it was completely random really. We bought kind of these cushions and some home furnishings and just some odd bits that we wanted to sell online really. So we’re selling stuff on Ebay, and we were doing odd market stalls, and we actually really enjoyed it. It kinda got us out and about, and we’re obviously glutton for punishments, because we just gave up our entire free time to run this business while we were both working full time. So it wasn’t easy, but we enjoy it, yeah. Yeah, definitely. And like you said, yeah, it was pretty much our weekends we spent. We actually went to sort of farmers markets and things like that. We sold our soft furnishings on there, and yeah, like you said, it was our evenings and weekends, even though we’re working full time that we actually invested into this sort of extra business. So we did try and make the decision to take it one step further and invest into a website. Yeah, exactly. And we’ve always enjoyed design. Lyndsay, you’ve got your marketing background, and I’ve always known a little bit about HTML and CSS, so I had the skills potentially to be able to build a website, but we wanted it done properly at that point, wanted to make sure it was an online shop, people could buy from anywhere in the world. And we just wanted to hire a professional really, so we actually paid a web designer to build this singing, all dancing website. And it was a real struggle financially for us to do it, but we managed to get the money together, didn’t we? Yeah, we did. And I remember now, I think it was 1400 pound, which I mean money is relative, isn’t it? So at the time, that was all the money that we had in the world. We had to save up quite a while for that, and yeah, it was a really, really big investment for us because we weren’t massively well paid from our jobs at the time. We were just starting out in our careers, and so, yeah, this was a big, huge investment, and we put everything into it. 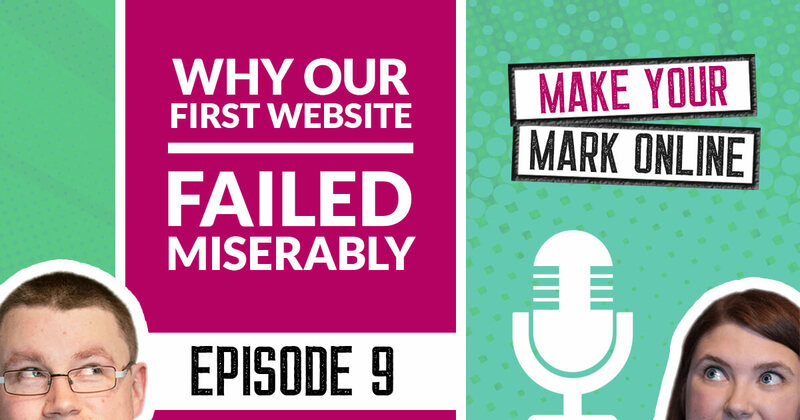 So I think this episode really is about how we can help all the people not make the gigantic mistakes that we did when we first got a website. And we were just excited, and we were trying to be proactive, and we were trying to be positive. And the business model in general that we had was actually quite risky in the fact that you buy products with your money, and then you have to try and sell and recoup the costs. So it’s not like a freelance business, is it? Where you can just make money just by doing your service. There’s a lot of risk there, and we actually put quite a lot on our credit cards to start off with, which is never a good move. Yeah, and it was, even though, you said it was quite a risky business strategy, probably was one of your better ideas, Martin, if I’m honest, wasn’t it? Because Martin, bless him, when I first met him, he had every business idea under the sun. Of course. That’s how businesses start. I wouldn’t be here today, if I hadn’t come up with random ideas that never would’ve worked. … Business ideas that he’s ever come up with. But yeah, this one was actually, even though you said it was a difficult one, it was probably one of your better ones to begin with, Martin. So why did it fail? That’s the ultimate question. Why did this business fail? And why did the website not work? Yeah, I was hooked in by the prettiness of it. But that’s a mistake that I think a lot of people make. You potentially look at the web designers that have the glossiest website, and we actually hired somebody who was fine. I mean he was a nice guy. We got along with him very well. Nothing to do with him. It’s just that if we’d had done more research, if we would’ve spend more spent, we’d have potentially gone with somebody else. Yeah, exactly. And like I say, it was a nice process. There was nothing wrong with it or anything, but we invested all of our money in that, so essentially what we did is we saved up so much, and we’d already got lots of stock piling up in our spare room, and we spent the rest of our money on this web designer. And we didn’t have anything left, so in our minds, we were like, “Well, I’ve gotten nothing left, so this has to work.” And we didn’t have a leg to stand on. No, no. Definitely. I think it was a combination of having this mentality of, “We just need to have a pretty and functioning website, and that’s all we need. And this is the last penny that we’re investing, so it has to work.” And two of those things kind of really collided, didn’t they? And kind of ended up in a disaster. And yeah, having no back up funds, no money for extra marketing, just no money for food in some cases was not a good place to be. We really exposed ourselves, didn’t we? And it wasn’t great. Exactly. That is due to our own, not even our client’s experience, but our own experience. We never want someone to go through that themselves because it really did leave us really financially vulnerable for quite a long time, didn’t it? Yeah, exactly. And it is a struggle. But aside from that also, again we don’t think that this web designer was probably right for us, as well. I mean, yes, if a big company was to hire him, and they’d get a nice glossy website, that’s fantastic, but we actually needed quite a bit of support, and it’s not his fault. It’s our fault for not doing the research, but when it comes to support, we didn’t know anything about how to update the framework that he’d given us and how to optimize our website for search engines, things like that. We didn’t have the tools to be able to really make the most of our website that we’d spent a lot of money in and invested in. Exactly. We didn’t have the tools that you said, and we didn’t have the time to sort of learn all that stuff either. 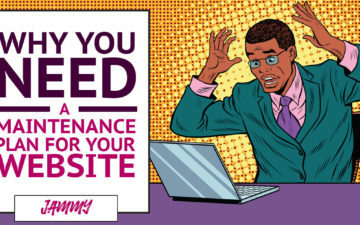 Especially after the website went live, we were like, “We just need the money back now,” but we didn’t have the time to actually think, “Well, what do we need to do to learn to make this website a success?” We just expected it to come back straight away. And I think, yeah, the web designer, it’s absolutely nothing of his fault at all, but we did need that extra support. It was built on a platform called … It was OpenCart? Boo. Booing it. But it was really difficult for us to use, wasn’t it? Yeah. If any of you have used that platform in the past, you’ll know exactly what we’re talking about, but it’s not the most search engine friendly. The URLs that they create are just horrible, and it’s really difficult to optimize it. And that’s why we’re very particular these days about the framework that we use, and we have to trust it. If somebody came to us and said, “I’d give you 50,000 pounds to build a website in OpenCart,” I don’t think I’d be able to sleep at night taking someone’s money and actually creating a website like that. And it’s partly due to the fact that we didn’t have a choice. We just got the platform that we got given. But we didn’t even research, did we? I don’t think we were even aware that there were differences, but certainly, we didn’t do our research about what platform to use for a shopping website or even what platform to use for a website. We would always tell people to do their research first and find out platform actually works for them. But yes, for us, that was a real struggle, and we spent our time, rather than actually learning how to market our business, how to do better with our website, we spent our time just learning the nitty gritty bits of how to organize postage and how to do all these little things that were really complicated. And it was just a lot of work. A lot of evenings, weekends actually spent just doing that, while we were losing money essentially on the website itself. And what we really needed at that point was just a lot of traffic. We just needed to try and drive as much traffic to our website as possible, and we didn’t have the time to do that because we were focusing on the nitty-gritty parts of managing the website. But that for the most part, would’ve solve a lot of problems. If we’d had spent more time promoting it on social media, maybe focused on learning more about SEO, which we didn’t have a clue about at the time, then we could’ve still moved forward, but I think it was just such a big weight on our shoulders with the money that we’d invested, and we just wanted it to work. And it was just a real struggle. But I do think, if we’d of had a website buyers guide, for instance like what we’ve created, then we would’ve been able to protect ourselves to a certain extent, and we would’ve potentially hired another agency, and we’d of had a better mentality really about going into a business and accepting that “Build and they will come” was going to just miraculously happen, probably wouldn’t have been the case. Yeah, definitely. And I will put a link to the website buyers guide in the notes because it’s useful for anyone who wants to get a new website or redesign their website. We don’t recommend us, by the way, but it’s a guide for you, if you’re shopping around for a website, so it’s really useful. Yeah. We spent quite a lot of time on that because we wanted you to be able to avoid making the same mistake that we did. That was one of the big drivers for it. Yeah, definitely. So just talking as well, when the website went live, we didn’t get, as Martin mentioned, any traffic to it at all. We really struggled. And we had this mentality that once it was built, it would just magically get traffic. We were quite naïve about that. And I remember you coming home one day from work, and I was going, “I’ve heard of this thing called SEO, and I think it’s quite interesting actually. I think this stuff works, but I don’t understand any of it. Will you help me with it?” And that was kind of the first time we’d ever heard of SEO, wasn’t it? Yeah, and then what we did is obviously … ‘Cause we’re quite positive at that point. We just launched, and went to web designer, and we said, “SEO. What can we do? How can we do it?” And he said, “Oh, well. It’s expensive. If you want us to do it, it’s gonna cost this much.” I think he quoted it at over a thousand pound a month that some clients pay for SEO. For us then, may have well been a million pounds, really. It was just impossible. Yeah, it was impossible for us to be able to invest even a couple of hundred pounds a month, never mind that much. So it was a real struggle, and that was really deflating, especially because that’s when he decided to tell us, “Well, you’re in a very competitive niche,” which was an even bigger blow because it meant that even if we did optimize our website, it’d still be a real struggle because we were trying to optimize for unique gifts or home furnishings or cushions or whatever it is that we were selling at that point. So it was a real kind of de-motivator at that point to know that we’d spent all this money on this website, and it was a real struggle. It felt like we were at the bottom of a mountain, didn’t it? Yeah, it did. And I don’t think it was his responsibility to tell us, “You know, you’re in a really competitive industry.” We’re selling cushions, so we could’ve realized really that we were in a competitive industry, but yes, I think it was just this naivety that we sort of took to actually doing the website. Yeah, definitely. And that’s something, I think, we need to discuss a little bit, as well. Sometimes, we actually let our excitement for the business, and Lyndsay’s passion for these owl cushions that we just had an abundance of. I loved the owl … I miss the owl cushions. That we actually went sort of too fast because we were so excited about the business, which it sounds like a good thing, but actually it can lead you to make the wrong business decisions, hence hiring a web designer at the point when we didn’t necessarily need to. We believed in the products so much, and our enthusiasm would just sort of take us to be a successful business, and we could live on a beach. That kind of business model. With cocktails, selling owl cushions and being millionaires. Yes, it’s all done to our naivety, and the fact that we didn’t realize how much work it would be to be able to build a website and grow the website. And I think that’s the thing. You think that the website is everything. You think it’s going to just generate business, but it is means to an end really. Yeah. Yeah, I always say that the website is not the end. It’s the beginning. Getting a new website is just the beginning of your business, and we viewed as the end. “That was it. That was all we needed. We were going to be a success.” No, it’s actually the beginning of everything because a website is the heart of your business, but you’ve still got to kind of pump blood to it in a way. You’ve got to make sure that you’re building a business on it. You’ve got to get traffic to it. And we didn’t understand any of that, really. We were just selling a product that was available on Amazon, on Ebay, on hundreds, probably thousands of other websites, as well, and we didn’t really give anyone a reason to buy from us, did we? No, we didn’t differentiate ourselves. We were trying to compete on price. There was no benefit from hiring us, or buying from us, rather than buying off Ebay, and you could probably even get it a bit cheaper. So the profit margins weren’t there because we were competing on price. We were too scared to do any kind of content at all. We were brand new to social media marketing at this point, and we barely even touched Facebook. But again, we had that encouragement. We didn’t mind getting out of there. Well, we had owl cushions. We had lion cushions. We had monkeys. Yeah, so we did some really fun stuff, didn’t we? Yeah, like Martin said, we went to the park, and we even stopped at a zebra crossing, and we put our owls on the zebra crossing, like on the cover of a Beatles album, I think it was, and we tried to emulate it. And yeah, we took pictures. We gave all the owls their own names. We made poems for them. She’s very proud of the name thing. I don’t know. And I am very proud of the names because the supplier actually stole that from us, I’m sure. She still says that. It’s true. They didn’t have names before, and they did after. They didn’t, and then they had names afterwards. And our names were better, I think. Our names were really good, yeah. Sebastian the lion cushion, yeah. It was a very fun business. It was exciting, and I think that’s why we let our hearts rule our heads. And that’s why because we were so enthusiastic about it, we just assumed that the world would be, as well. And it’s not the case, and that’s why it’s really important that you have a strategy behind how you’re going to market your business once the website is done. And like Lyndsay said, the website is just the starting line. It’s not the end line. And by considering what your buyers might want, it’s a good place to start on your content marketing. Literally, your website is such a fraction of the effort in your business, that as long as the website’s set up a certain way, and it’s built to convert people, and it’s built to attract search engine traffic as well, then the rest of the effort goes into the marketing and the promotion and writing helpful blog posts and going down the real kind of nooks and crannies really of content marking. Yeah, and I think the biggest mistake that we also made … There was lots. There’s lots of biggest mistakes we also made. Was probably that we were so obsessed with the website and how each little bit looked, so we thought, “Oh, we could move that bit down there. Or we could change the color of that button. Or we could make that slightly bigger.” And we got so obsessed with the details, but like what we said what we really needed was to do content marketing. We needed to drive traffic to the website because changing those little details is pretty useless ’cause no one was on the website anyway, apart from my mom. Thanks Mom. She went on the website. I think she pity bought a product, which is never a good place to be. So yeah, it was a struggle. So from what we’ve learned from this whole process, what would you advise people to do in future if they were going to get a new website? I think the website buyer’s guide is going to help. I know it’s our product. We don’t get anything. We’re not selling it to you, but we definitely put it together to avoid this kind of scenario. So definitely check it out. But the research mentality is so important. Try and take your heart out of it. Try and use your head when you’re making buying decisions in general, never mind when you’re hiring a web designer. But if you are brand new, then try doing it yourself first. We’re never going to stop teaching this. Try doing it yourself first, get on Shopify, or try and launch a WordPress template that comes with the shop. Just try and do it yourself first. See how far you get. If you struggle and you’re having problems with it, then try and find someone that can help you move forward one step at a time. 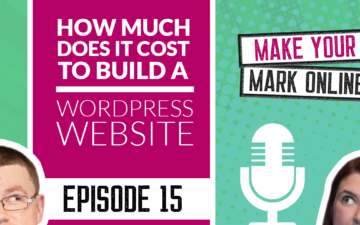 Don’t just go straight to step ten, which is pay over a thousand pound for your brand new website with a brand new business that you’ve not been able to validate yet. Yeah, definitely. And we’re not just talking about shopping sites either. We’re actually talking about all websites. Obviously, it’s a bit more complicated with a shopping website, but I think this applies to all new business. Make sure you do that research first ’cause it’s not just shopping websites that are complicated. Web design itself is very, very complicated, so make sure that you do that research and, yeah, that buyers guide should be able to help you. No, and it definitely ended in death. Flat lined completely. Yeah, definitely. And I think if you’re finding yourself struggling to pay for a website, it’s not a good time to invest in it. We would never ever want a client that was not financially comfortable giving us their money. It would just be horrible, and it’s not a nice place to be. No, it’s okay if you’ve already got a business, and you’ve generated it. Like go back and listen to episode one, if you’re concerned about whether or not you should or shouldn’t invest. But if you’ve already got a business, and it’s established, and you’re already getting customers, then yes, maybe at some point, you need to think about hiring a web designer. But with a brand new business, it’s a very risky tactic, especially if you’ve got three or four thousand on a credit card for these piling owl cushions. Yeah, definitely. And finally, I think it’s just to understand and have the mentality that once the website is built, that’s when the work starts, that’s when your content marketing has to start, that’s when you have to think about CEO, social media marketing, email marketing, all these kind of things. You need to start getting blood to the heart really. You need to just start getting traffic and conversions, and that doesn’t just happen on a website. That requires a lot of work itself. And we don’t want to put people off, but we don’t want to lie to you or tell you that it’s easy because it’s not. It’s not easy, but it is worthwhile doing it and learning this stuff, as well. Yeah, and we never want to be the kind of podcast hosts that just kinda tell you that it’s all sunshine and rainbows. And that’s kinda why we wanted to kinda break it down a little bit and tell you that we’ve been in the same position that potentially you’re in right now, or have been in the past. And it’s all about us being open and honest about it, so that if you are in that position, don’t beat yourself up about it. We made the same mistake, as well. We’re just here to hopefully prevent other people from making that mistake, as well. Yeah, and we obviously try to be as supportive as we can, as well. So we send training videos and lots of help for resources to be able to help businesses grow, and that’s something that we don’t feel that we got, so that’s something that we’ve learnt that we’re able to give back now. Yeah, definitely. Usually after we’ve built a website, we have like an hour with the client, don’t we? Where we say, “Okay, this is the kind of stuff you could possibly do to sort of grow your website further,” isn’t it? But it’s definitely not something where I look back and think, “I wish that would have had happened,” because without it happening, we wouldn’t be where we are today. So I definitely do regret it one bit, but it was fun. But I think how we reacted to that disappointment is what really changed things for us and how we could’ve looked at it in a negative light and thought, “You know what? We tried doing a business. It’s rubbish. You can’t do it. I’d rather just get a normal job.” We truly believed in the life that we wanted to live, and that didn’t involve working for another company. So yes, it didn’t work this time, but we kept going on that road, and we pushed forward, and we then launched our very first web design business and got out first clients, and immediately, we saw the benefit of the failure that we’d lived through. Yeah, definitely. And we’re still learning now. We learn every day all new things, and we keep investing in learning, isn’t it? Because it’s just so important that you do. I mean we never ever stop learning, and everything is an opportunity to learn, even the massive failures. So this got really all philosophical, didn’t it now [inaudible 00:26:11]? No, don’t make me say that word. Pheno … Can we edit that out please? Never. Never been able to say that. No. He’s not going to let me edit that out. So I hope you found that useful and not too negative because like we said, we did bring some positives from the experience, and I hope that you were able to hopefully learn from our mistakes at least. So before we go, don’t forget to register for our SEO webinar on the sixth of September. Like we said, there are limited spaces available, so make sure you get your name down for that. You can’t access it without actually giving us your email address, and then we’ll send you an unique link. 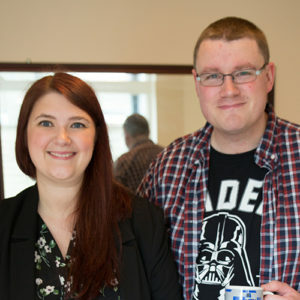 Make sure you turn up early because we do have limited spaces, so make sure you get a space, and we’ll see you next time on the Make Your Mark Online Podcast. Super interesting! I’m glad you could take that knowledge of what went wrong and use it to help others.